The fastest way to stay compliant with the experts in Appraisal Management. We want to make your community bank’s transition into compliance SIMPLE, EASY and PROFITABLE! SAMCO Appraisal Management Company does one thing, and we do it well: provide compliance with federal mortgage lending requirements for Community Banks through Appraisal Order Management and (most importantly) Appraisal Review, at NO COST to you, the Lender! SAMCO has a group of valuation products that provides complete appraisal independence and USPAP/Appraisal Standard reviews. From narrative commercial appraisals to Fannie-Freddie Residential to Consumer Lending evaluations, SAMCO provides everything the community banker needs from the start of the valuation order to all file documentation at the end. These underwriter ready appraisal ad evaluation reports ensure compliance with Dodd-Frank, Gramm-Leach-Bailey, USPAP, Fannie-Freddie, and UCDP. At SAMCO, our goal is to be the best AMC company out there and to provide appraisal management services that are efficient, effective, and affordable for your financial institution. What sets us apart from other AMC companies? Along with hitting all the checkboxes in efficiency, effectiveness, and affordability, we specialize in working with small banks and credit unions. When you work with SAMCO, you aren't getting average AMC appraisals, you're building a partnership with an AMC firm that cares about your success. At SAMCO, our goal is to provide professional appraisal management services that are efficient, effective, and affordable for community banks. If you're looking for a trusted & experienced AMC company, contact us about our appraisal management solutions today! In everything we do, we believe in open and honest relationships. In knowing our client (the community bank) and providing valuable service the way they know and work for their customers and community. The way we achieve that client relationship is by always being available, improving our client’s service to their customer, providing regulatory compliance, and saving our client actual dollars. We just happen to provide great appraisal/evaluation order management and review. Want to see how easy it is to work with SAMCO? Here at SAMCO Appraisal Management we offer a robust line of managed appraisal services for our clients the community bank, from Residential Appraisals to Commercial Evaluations. We utilize a very customizable management platform that will integrate with many ordering systems. Do you need custom reporting? NO PROBLEM!!! We can track our data in real time to give the most accurate reporting possible. Our transparent communication, flexible array of services, and commitment to our clients makes us the AMC of choice for many community banks across the U.S. Have a special case scenario or just want to discuss appraisal management in general. Please contact us we would love to discuss what your needs are and provide you with solutions. SAMCO is an outsourcing solution that works for Community Banks, engaging their local appraisers, managing performance, providing an Appraisal Standard - USPAP scoring and review, and much more! The quality of an appraisal has always been important to the Community Banker, but now the appraisal must meet USPAP requirements. SAMCO provides a scored review for each appraisal. Consumer Lending needs economical and accurate evaluations. Federal regulations have eliminated many evaluations formats (tax card, AVM, BPO). SAMCO has developed an evaluation product that meets the community bankers need. Because SAMCO has a community bank background, we understand the wide range of customers a local lender has in their community. We provide residential AND commercial appraisal and evaluation management. We have found our experience with SAMCO to be very satisfactory. They have handled all appraisal transactions in a timely and professional manner. We feel that the quality of our appraisals has improved since we began utilizing SAMCO's appraisal management services. SAMCO's website is simple to utilize. Placing orders and tracking the status can be accomplished with ease. Since partnering with SAMCO, we believe the quality of our appraisals has greatly improved. We are very pleased with their appraisal turn times. 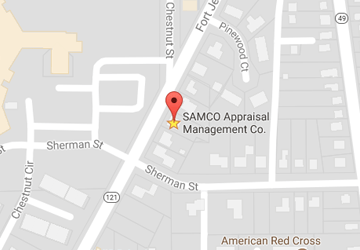 SAMCO Appraisal Management Co., LLC. 's service is professional yet personal and excellent to date. Without hesitation, we highly recommend SAMCO Appraisal Management Co.
My own personal impression of the company, from the prompt responses to difficulties arising from hardware failures such as telephone or e-mail lapses, is very favorable. SAMCO works to resolve issues fully and promptly and keeps clients informed of the resolutions and their time frames. SAMCO has made the transition to this new regulations very smooth. Their service is excellent to date and as we continue our relationship, I feel we are both gaining in our knowledge of how appraisals and values vary across the country. Keep up on our always evolving industry. Sign up and stay in touch; we guarantee 100% privacy.